Rosetta is arguably one of the most important pieces of software Apple ever shipped, and the tale of how it came from a British startup with a unique, powerful technology is rarely sung as a UK tech industry success story. Here we talk to the CTO and co-founder of that company to find out how it happened. Rosetta is the software that allowed Apple to make a shift that resulted in it opening Macs up to a much wider market by switching from the PowerPC processors it had used before to Intel chips which, crucially meant Macs could dual-boot to run Microsoft Windows much more effectively than before – a big selling point for customers considering a switch to Apple computers. Intel’s processors had lower power consumption too, leading to longer battery life on laptop computers. Rosetta was unveiled when Steve Jobs announced the switch to Intel processors in June 2005. Billed as “The most amazing software you’ll never see,” Rosetta allowed apps designed for PowerPC processors to run on Intel-powered Macs. That was no mean feat – this kind of translation took serious technical expertise but without it, Apple would have faced a serious backlash from users whose apps would be rendered obsolete the second they upgraded to an Intel-powered Mac. Apple found the skills it needed to translate from PowerPC code to Intel code in a startup called Transitive which had been founded in 2000 in Manchester, UK. Its co-founder and CTO, Alasdair Rawsthorne, had started his career in electronics, building mainframe computers before taking a job as a lecturer with Manchester University. While on a sabbatical with a French firm in the early 1990s, he developed an interest in the idea of translating code between processors. Upon return to his university job he began research into making this dream a reality. Having successfully developed technology that would do the job, Rawsthorne tried to sell it to ICL, the Fujitsu-owned company Rawsthorne had stated his career with. Despite interest from the firm’s engineers, that deal never got off the ground and he ended up taking a leave of absence from the university to launch Transitive. The company was spun out as an independent business, with Manchester University maintaining a shareholding. After obtaining VC funding in October 2000, Transitive opened an office in California to deal with the big technology firms it hoped would pay for its services, while basing its engineering staff at home in Manchester. 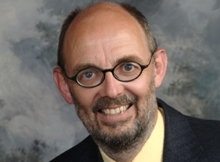 Rawsthorne says that in 2000, there was perhaps only a dozen technology companies in the world likely to need Transitive’s services, and the first one to bite was computer graphics giant of the time, Silicon Graphics. It was in the middle of transitioning the machines it sold to a new chipset. It suffered a ‘chick and egg’ situation where customers didn’t want to buy the hardware as none of the old software would run on it, while third-party developers didn’t want to build software for the new machines as there weren’t enough customers. It was a desire to avoid a similar problem as SGI that led Apple to show an interest in Transitive. Rawsthorne says that information about the exact timing is probably still a little sensitive even to this day, but that the startup worked with Apple for a number of years in advance of the 2005 announcement of a shift from PowerPC to Intel processors. Typically secretive Apple bound Transitive in non-disclosure agreements as work on what would become Rosetta took place. “It was really quite frustrating and challenging, knowing that we were doing some fabulous work with Apple and not being able to talk about it,” says Rawsthorne. While Rawsthorne had been working on the technology behind Transitive for around a decade by the time Rosetta was announced at Apple’s World Wide Developer Conference in June 2005, it was only then that the world at large got to see exactly how significant that technology was – that “The most amazing software you’ll never see” tag line encapsulating the product with typical Apple flair. 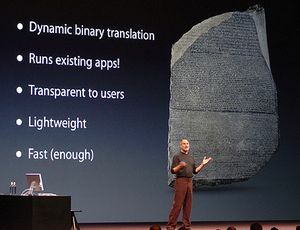 Transitive worked with Apple to support Rosetta for several years afterwards, and the app itself lived on inside OS X until earlier this year when version 10.7 Lion launched without it, discontinuing Rosetta and finally ditching support for PowerPC Macs five years after the first Intel-powered machines launched in 2006. After the Apple deal was revealed, Transitive found its services a much easier sell. “It was much easier to get people to take us seriously,” Rawsthorne says. The company worked on projects for IBM, Fujitsu and Sun Microsystems among others as well as selling its own stand-alone software to run on server. Transitive was eventually acquired by IBM in 2008, and its products have now been discontinued. The Manchester office now works on completely unrelated projects. After a few months with IBM, Rawsthorne returned to his job at Manchester University and is now developing new technology which would allow computers to learn how people use them and optimise their performance for individuals, leading to more responsive software and longer battery life. He’s currently unsure about whether it will be licensed or sold to other companies, or perhaps launched as a start as Transitive was, but whatever happens he wants to see it used by as wide an audience as possible. That may be so, but even if he’s not shouting about it, the success of Transitive means it’ll be worth keeping a close eye on what he does next.